Take your lawn to the next level with our lawn maintenance service! Your lawn and landscape design are important tools when you're looking to increase the curb appeal of your home. Here in Tallahassee, FL, there's one lawn maintenance company to call when you need to keep your yard looking pristine year-round. When you call The Cutting Edge Lawn & Design, you know that you're getting superior lawn services. The Cutting Edge Lawn & Design has been providing quality work and professional service to Tallahassee, FL & the surrounding area for over 13 years. The Cutting Edge Lawn & Design is a locally owned, family oriented, full service lawn company owned by Brian Durden. No matter what your lawn service needs may be, we are always there to help. Our lawn maintenance team takes pride in their work & treats every job as if it was the most important one. Our client's satisfaction is extremely important to us, and we will ensure that we deliver quality work, timely and friendly service to all of Tallahassee, FL. Our landscaping experts will provide you with exceptional service to accomplish even the most challenging projects. We do the work so you don't have to. If you'd like to spruce up your home's curb appeal, let The Cutting Edge Lawn & Design help you get your property looking its best! Our landscape design experts are ready and waiting to help. We'll make your yard the envy of Tallahassee, FL with lawn maintenance, landscape services, and more. Call today to learn more about our lawn services! Don't worry yourself with day-to-day lawn maintenance! It is where you gather with friends and family to entertain, it's where your kids play and most of all is an expression of you. It does not matter if you are just moving into your home and want a beautiful yard for all to see or if you are ready to sell your home and want the perfect curb appeal - we can design the right look to fulfill your needs. At The Cutting Edge Lawn & Design, we offer comprehensive lawn maintenance services ranging from mowing, edging, and weed-eating to trimming of shrubs and low-hanging branches, mulching and blowing. We only use the best high-quality equipment and keep all equipment meticulously maintained so no added stress from dull mower blades is ever transferred to your lawn. If you’re ready to have the best Tallahassee, FL yard ever, please give us a call today for professional lawn maintenance services. At The Cutting Edge Lawn & Design, we understand how important it is to have a well tended yard. That's why we provide the most reliable lawn maintenance service in town. Whether you want a regular cutting service or need help with landscape design, we can always be counted on to show up on time, complete our work professionally and expertly, and keep our prices competitive. When you want your yard and landscaping to look its absolute best, The Cutting Edge is here to provide star quality lawn service. Professional, excellent lawn service to impress! 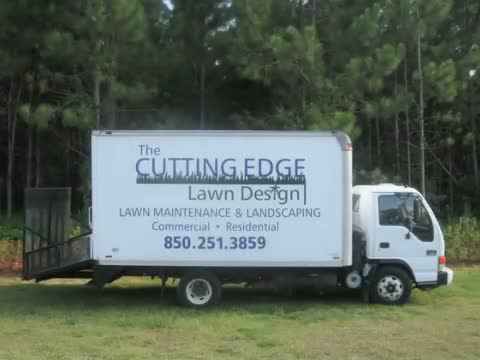 The Cutting Edge Lawn & Design offers landscape design and lawn service for both residential and commercial customers. We will always provide friendly and courteous service to every customer that allows us to take care of their property. We strive to design a picture perfect lawn or office entrance just for you. No other companies in the area can match our lawn maintenance services! Let us help you maintain the greenest lawn in your Tallahassee, FL neighborhood. The Cutting Edge Lawn & Design is committed to providing quality lawn service to the area, from landscape design to regular mowing. We pride ourselves in our courteous service, prompt arrival time, and competitive prices. Call today to learn more about our lawn maintenance services! We offer a variety of lawn service packages! We pride ourselves on being able to listen to our customer's needs and desires to design a professional look that best suits the taste of each client. We have many business owners and churches in the area that we provide service to on a regular basis. Each client is important to us and we appreciate their business. If your business or home needs a more professional look we can help. Call for a free estimate today 850-251-3859. For that picture perfect lawn, call The Cutting Edge Lawn & Design today. Our lawn maintenance company takes pride in providing expert, efficient lawn service for the entire Tallahassee, FL area. We can help with every step of the way, from lawn care and maintenance to landscape design. Give us a call today to get started! The Cutting Edge Lawn & Design is a full-service lawn company, offering lawn maintenance, landscape design, backhoe work, underground drains, pine straw, and more for both residential and commercial customers throughout the Tallahassee, FL area. We are licensed and insured, and offer free estimates for your convenience. Call today to learn more!